Rice bran oil is obtained from the hard outer brown layer of rice. This sounds like fiber and makes one wonder exactly how oil is extracted from it. Rice bran oil is a popular cooking ingredient in Asia. It is also used in the production of vegetable ghee. 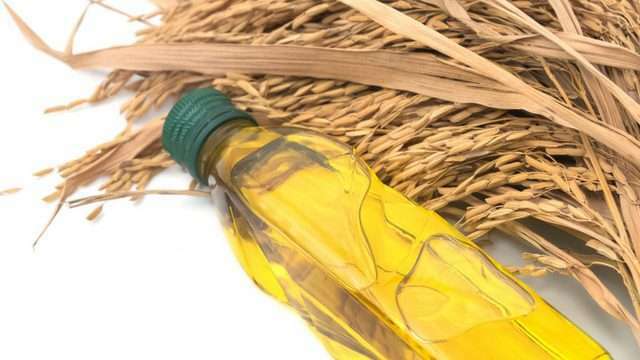 Rice bran oil is extracted via several processes starting with the use of a solvent initially followed by neutralization, bleaching, and deodorization. This process stabilizes the oil giving it a longer shelf life. However, it also means the end product isn’t 100% natural but it’s still useful for hair treatments. There are also cold pressed rice bran oil brands available. The composition of rice bran oil is similar to that of peanut oil. Rice bran oil has a high smoke point of 450 °F. This makes it suitable for use with heat appliances and in high heat cooking (food grade quality only) such as deep-frying and stir-frying. Rice bran oil has a mild neutral flavor and is light amber in color. Is Rice Bran Oil Good for Hair? Yes, rice bran oil is excellent for hair. It contains essential fatty acids and vitamins that enrich the hair, nourish follicles and promote healthy hair growth. Read on for more benefits of rice bran oil for hair. Rice bran oil revitalizes dry and dull hair. Rice bran oil contains oryzanol, which helps protect hair against the sun’s UV rays. Rice bran oil reduces oiliness on the scalp fostering an environment for healthier hair growth. Rice bran oil nourishes the hair follicles. Rich in vitamin E, it keeps hair soft and frizz free. 5 – 10 drops of your favorite essential oil. Mix the deep conditioner and rice bran oil thoroughly then add the hemp seed oil. Stir and add in the essential oil if using. Stir until all the ingredients have married well with each other. Shampoo your hair and pat dry with a turban then apply the mask to your hair in sections. Apply like you would a perm and smoothen throughout the hair then cover with a shower cap and hot towel. Leave on for 30 – 45 minutes. Alternatively, use a steam cap or tabletop steamer for the same amount of time. Rinse out thoroughly and style your hair as usual. Several treatments a month should lead to an improved appearance in your hair. To get the benefits of the oryzanol, you can also use rice bran oil for sealing. It’s lightweight and should absorb without leaving a greasy feel to the hair. Rice bran oil needs to be stored in the refrigerator to keep it from going rancid quickly. It can last up to 3 years if stored this way. Rice bran oil is safe to use on hair and has no major side effects. If you will be ingesting it however, it’s not suitable for anyone with GI conditions. 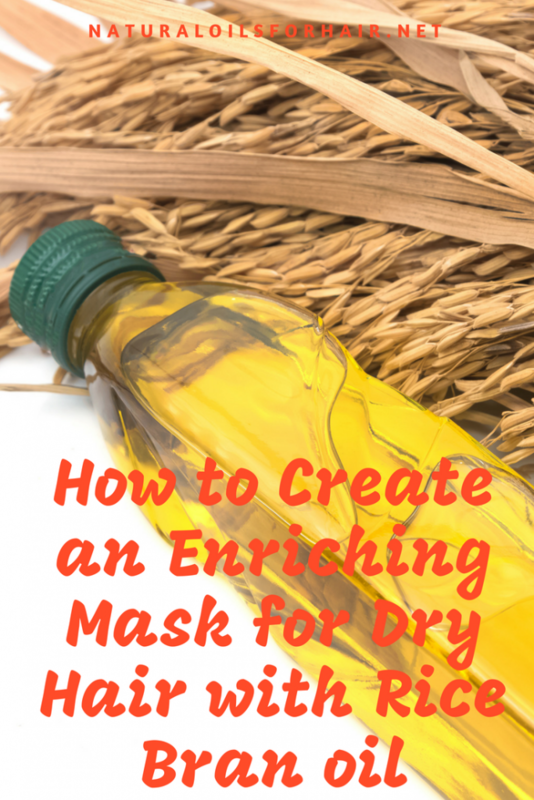 Have you tried rice bran oil in your regimen? Let us know your experience in the comments section. If you’re interested in learning more about natural oils and how to use them for specific purposes to achieve optimal length and health, have a look at How to Grow Your Hair Healthy & Long with Natural Oils. The book is a comprehensive guide about natural oils. Available in Kindle & paperback format. Subscribers get up to 30% off. Check it out HERE. I bought a bottle recently. I thought if rice water is good for hair then an oil that is extracted from rice must be good. Right?